Applications of Synthetic Resin Latices in the Construction and Building Industries--Bonding and Sealants. Plasters and Hydraulic Binding Agents. Latex-based Additivies for Cement Formulations. Decorative Facings and Wall Coatings. Applications of Latices in the Paper Industry. Polymerisation in situ in Skins. Treatment with Non-vinyl Latex Dispersions. Binding of Leather Scrap with Latices. Applications of Polymer Latices in Manufacture and finishing of Textiles. Treatment of Specific Fibres and Fabrics. Latices in Non-Woven Fabric Manufacture. Direct Fibre Spinning from Emulsions. 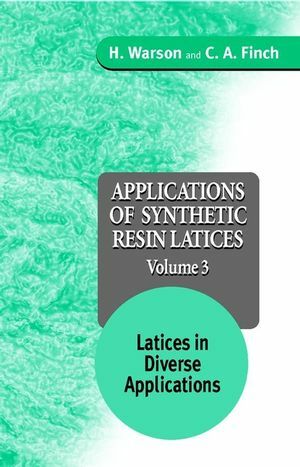 Applications of Synthetic Resin Latices in Polishes. Formulation of Polishes and Sealants. Polymer Latices with Metal-Based Crosslinking Agents. 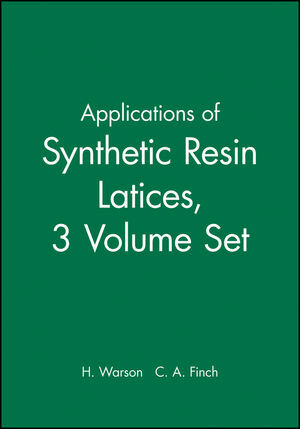 Miscellaneous Applications of Polymer Latices. Vibration Damping and Sound Deadening. Coatings for Synthetic Films and Sheets. Other Miscellaneous Applications of Latexes.